Hepatitis B virus (HBV) infections play an important role in the development of hepatocellular carcinoma (HCC). HBV X protein (HBx) is a multifunctional protein that can modulate various cellular processes and plays a crucial role in the pathogenesis of HCC. HBx is known to interact with DNA helicase components of TFIIH, a basal transcriptional factor and an integral component of DNA excision repair. In this study, the functional relevance of this association was further investigated in the context to DNA repair. By site-directed mutagenesis HBx's critical residues for interaction with TFIIH were identified. Similarly, TFIIH mutants lacking ATPase domain and the conserved carboxyl-terminal domain failed to interact with HBx. Yeast and mammalian cells expressing HBxwt conferred hypersensitivity to UV irradiation, which is interpreted as a basic deficiency in nucleotide excision repair. HBxmut120 (Glu to Val) was defective in binding to TFIIH and failed to respond to UV. We conclude that HBx may act as the promoting factor by inhibiting DNA repair causing DNA damage and accumulation of errors, thereby contributing to HCC development. Hepatitis B virus (HBV) infection in humans is a major health problem and is one of the principal causative agents of liver disease. It is estimated that over 500 million individuals are infected with HBV worldwide and 1 million deaths are annually attributed to the effects of HBV infection [1–3]. The virus is associated with both acute and chronic liver disease. Although the sequence of events in the development of hepatocellular carcinoma remains poorly defined, a significant correlation has been made between long-term carriage of the virus and the development of HCC . Modes of HBV infection are generally from mother to infant (vertical) and by sexual routes. The direct or indirect role of HBV in the development of HCC appears complex. First, in the absence of reproducible in vitro HBV propagation system, the pathogenesis steps are poorly understood. Second, there is a lack of evidence for HBV replication in tumor cells that arise in HBV infected patients, despite active replication in surrounding non-tumorous hepatocytes. Furthermore, it has been observed that virtually 100% of woodchucks chronically infected with WHV at birth develop liver cancer and die of HCC . Several mechanisms by which HBV infection could lead to the development of HCC have been proposed. These mechanisms include insertional mutagenesis upon integration, trans-activation of the cellular genes, activation of signaling pathways, inactivation of tumor suppressor proteins, synergy with environmental carcinogenesis and host immune response. One of the open reading frames of the HBV genome encodes a protein termed HBx. HBx is required for viral infection and has been implicated in virus-mediated liver oncogenesis. The HBx protein has been detected in liver tissue from patients with chronic HBV infection, cirrhosis and hepatoma [5–10]. It is now generally acknowledged that HBx supplied in trans can increase gene expression of a wide variety of viral and cellular promoters and enhancer elements [11, 12]. Recent studies have demonstrated that HBx possesses both cytoplasmic and nuclear specific activities. A number of cytoplasmic activities have been attributed to HBx including, the activation of Ras/Raf/mitogen-activated protein (MAP) kinase, MEKK1/Jun kinase,  protein kinase C signal transduction pathways . Several putative nuclear targets of HBx have been revealed including, ATF-2/CREB transcriptional factors [15–17], RNA polymerase subunit RPB5 [18, 19], tumor suppressor protein p53 [20, 21], TATA binding protein (TBP) , a putative DNA repair protein UV-DDB [23, 24], TFIIH [25, 26], and RNA polymerase II . AP-2 and C/EBP have also been implicated as potential targets of HBx . HBx has been shown to stimulate transcription by RNA Polymerase II and III . Further, HBx was shown to induce either p53-mediated  or tumor necrosis factor alpha (TNFα)-mediated apoptotic destruction of liver cells [30–32]. The functional role of HBx during the HBV life cycle was defined by transfecting a mutant HBV genome, lacking functional HBx. In this case, a poor production of viral proteins was observed . In woodchucks an essential functional role of HBx in vivo was revealed, by the use of HBx mutant. HBx (-) mutant of woodchuck failed to replicate in their natural host . Although, in woodchucks HBx was shown to be important for establishment of virus infection [34, 35], the molecular mechanism of HBx activity and its possible influence on cell proliferation remains obscure. We have shown that HBx interacts with the XPD/ERCC2 and XPB/ERCC3 components of TFIIH and stimulates the DNA helicase activity of TFIIH . This was further substantiated by Haviv and co-workers . Further, we showed that HBx interacts with single-stranded nucleic acids in vitro , the implications of which in DNA repair process remains to be investigated. TFIIH is a multiprotein complex of 10 polypeptides . Apart from being an important factor of basal transcriptional machinery, TFIIH has been clearly shown to be an integral component of the DNA repair pathway [38–41]. In this study we explore the physiological relevance of HBx's association with TFIIH in the context of DNA excision repair. Although, interaction of HBx with a probable cellular repair protein UV-DDB was earlier reported by Lee and co-workers , a functional role in DNA repair which may result in lethal or hepatocarcinogenic mutations is not understood. This is also primarily due to the fact that a more defined role of UV-DDB in vitro DNA repair reaction is not established. Aboussekhra and co-workers [43, 44] have shown that the addition of UV-DDB during in vitro DNA repair reaction had a very modest effect on the repair synthesis. On the other hand TFIIH has been shown to be an essential component of DNA repair both in vivo and in vitro [43, 45, 46] Support for the role of HBx in DNA repair comes from experiments with the S. cerevisiae and mammalian cells expressing HBx, which displayed an increased UV hypersensitivity. Because of the high degree of homology between yeast and mammalian NER machinery, we have chosen yeast nuclear extracts to investigate the biochemical role of HBx in NER in vitro. Further, S. cerevisiae offers an elegant genetic background to identify the pathways by which HBx may affect this process. In this context, we used mutant yeast extracts with various genetic mutations to investigate the role of HBx in the NER pathways. Our results are consistent with the hypothesis that HBx impedes the DNA repair process. The genotype of S. cerevisiae wild type strain 334 is MATα pep4-3 prb1-1122 ura3-52 leu2-3, 112 regI-50 gal1. Two NER defective yeast strains rad 1 and rad51 were employed in this study. The genotype of Rad1 is (α rad1-2 his3Δ1 leu2-3-112 lys 1-1 trp1-289 ura3-52) and rad 51 (α rad51-1 his3Δ1 leu2-3-112 lys 1-1 trp1-289 ura3-52). Plasmids pUC18 and pBR322 were used for repair synthesis assays and were purified as described . Plasmid pSBDR contains sequences encoded by an HP1 to Taq1 fragment derived from HBV adw strain which includes enhancer 1 element followed by X promoter, the HBx coding sequences and the polyA addition site. In addition, pSBDR contains neomycin resistance marker for selection in eukaryotic cells. Yeast cultures of strain 334 containing plasmids, pYES and pYES-Xwt and pYES-Xmutant (as indicated) were grown in 2 ml of YMIN media (0.17% yeast nitrogen base, 1% succinic acid, 0.6% NaOH and 0.5% Ammonium sulfate) with 2% glucose. Saturated yeast cultures were washed in water and resuspended into 2 ml of sterile water. Then 200 μl of washed cells were added into 2 ml of fresh YMIN media containing 2% glycerol, 2% ethanol and 2% galactose for the induction of HBx and grown with shaking (200 rpm) for 24 h. Various cell dilutions were plated simultaneously onto two sets of YMIN plates containing 2% glycerol, 2% ethanol and 2% galactose. One set of plates was immediately irradiated under a germicidal lamp for various dosages of UV light and another set of control plates was not exposed to UV-irradiation. Plates were then incubated in dark for at least 24 h and shifted to 30°C. Colonies were counted to determine the survival fraction. HBx expression plasmid pSBDR and UV-damaged pRC/CMV were co transfected into Chang liver cells. Plates were incubated in dark for 2 weeks in the presence of 0.4 mg/ml of G-418. The number of G-418 resistant clones per 105 cells is plotted. Live cells were counted by staining with trypan blue after transfection and prior to G-418 selection. Yeast cells were grown at 30°C in 1 liter YPD medium (1% yeast extracts, 2% Bactopeptone, 2% Dextrose) to logarithmic phase. Cells were harvested by centrifugation for 10 min, washed in water, and suspended at 0.1 g/ml in 0.1 M EDTA pH 8.0/10 mM dithiothreitol. After incubation at 30°C with shaking (50 rpm) for 10 min, cells were pelleted by centrifugation as described above and suspended at 1 ml in YPS solution (1% yeast extract, 2% Bactopepetone and 1 M sorbitol) and yeast lytic enzyme (ICN) was added at 150 U/g of cells. Following incubation at 30°C with shaking (50 rpm) for 2 hrs, ice cold YPS solution was added (10 mg/g of cells). Spheroblasts were pelleted by centrifugation as above and washed three times in the same buffer. Phenylmethanesulfonyl flouride was added (0.5 mM) before the final centrifugation. Cells were washed again in 1M sorbitol and suspended at 0.125 g/ml in 5 mM Tris-HCl, (pH7.4) 20 mM KCl, 2 mM EDTA-KOH, (pH 7.4), 0.125 mM sperimidine, 0.05 M sperimine, 18% Ficoll, 1% thiodiglycol and with protease inhibitors. Spheroplasts were lysed in a motor-driven homogenizer with 10 strokes. The lysates were centrifuged in a sorvall SW34 rotor at 10000 rpm for 10 min and then for 5 min at 4°C. The nuclei were harvested by centrifugation at 13000 rpm for 30 min at 4°C. Nuclei were resuspended (0.6 ml/g of nuclei) in 100 mM Tris acetate (pH 7.9), 50 mM Potassium Acetate, 10 mM MgSO4, 2 mM EDTA, 3 mM DTT, 20% glycerol and protease inhibitors. Then, a solution of 4M NH4SO4 neutralized with NaOH was slowly added to 0.9 M, gently stirred and centrifuged in a sorvall SW34 rotor at 12000 rpm for 1 h at 4°C. The supernatant was adjusted to 75% saturation with solid NH4SO4 and neutralized with NaOH. Precipitates were collected by centrifugation in a sorvall SW34 rotor at 12000 rpm for 15 min at 4°C, resuspended in 1/15th volume of high-speed supernatant in 20 mM Hepes-KOH (pH 7.6), 10 mM MgSO4, 5 mM DTT, 10 mM EGTA, 20% glycerol (v/v) and protease inhibitors and dialyzed against the same buffer. Precipitates formed during dialysis were removed by centrifugation and the resulting nuclear extracts were stored at -70°C. The repair reaction contained, 0.3 μg of unirradiated pUC18 and 0.3 μg of UV irradiated pBR322 substrate, 45 mM HEPES-KOH (pH 7.8), 70 mM KCl, 7.4 mM MgCl2, 0.9 mM DTT, 0.4 mM EDTA, 2 mM ATP, 20 mM each of dGTP, dCTP, and dTTP, and 8 μM dATP, 2 μCi [α-32]dATP (3000 Ci/mmol), 40 mM phosphocreatine, 2.5 mg creatine phosphokinase (type 1), 3.4% glycerol, 18 mg bovine serum albumin and 100 μg of cell extracts. Reactions were incubated for 6 h at 30°C. Reactions were stopped by the addition of EDTA and then incubated with RNAse, SDS and proteinase K. Plasmids were digested with HindIII and loaded on 1% agarose gel. After overnight electrophoresis, the gel was photographed under near-UV transillumination with Polaroid film and an autoradiograph of the dried gel was obtained. Purified 24-mer oligonucleotide containing a unique GTG sequence (5'-TCT TCT TCT GTG CAC TCT TCT TCT-3') was allowed to react at a concentration of 1 mM with a 3-fold molar excess of Cisplatin (3 mM) for 16 h at 37°C in a buffer containing 3 mM NaCl, 0.5 mM Na2HPO4 and 0.5 mM NaH2PO4 . The purification of the platinated oligo was done by using 20% preparative denaturing polyacrylamide gel. The oligonucleotides were visualized using a hand-held UV lamp (254 nm) after placing the appropriate region of the gel onto TLC plate. The desired platinated oligonucleotide was excised, crushed and suspended in 1 ml H2O. The suspension was incubated overnight with agitation. The supernatant containing the platinated oligo was lyophilized and purified using Sephadex G25 column. Covalently closed circular DNA containing a single 1,3-intrastrand d(GpTpG)-Cisplatin cross link (pt-GTG) was produced by priming 30 μg of plus strand M13 mp18 DNA modified to contain a sequence complementary to the platinated oligonucleotide within the polycloning site  with a 5-molar excess of 5'-phosphorylated platinated oligonucleotide in a 200-μl reaction mixture containing 10 mM Tris-HCl (pH7.9), 50 mM NaCl, 10 mM MgCl2, 1 mM DTT, 600 μM each of dATP, dCTP, dGTP and TTP, 2 mM ATP, 60 units of T4 DNA polymerase and T4 ligase (New England Biolab) for 4 h at 37°C. Closed circular DNA was isolated by CsCl/EtBr density gradient centrifugation and purified by consecutive butanol extraction, centrifugation in cetricon-10 microconcentrator (Amicon) and a Sephadex G-25 column (Sigma). DNA substrates were stored at 80°C in 10 mM Tris-HCl, 1 mM EDTA pH 8.0. Ten μl reaction mixture contain 19 μg cell extract, 32 ng pt-DNA, 5 mM MgCl2, 40 mM HEPES-KOH pH 7.8, 0.5 mM Dithiothreitol, 2 mM ATP, 23 mM phosphcreatine, 18 μg bovine serum albumin (BRL, nuclease free). The reaction mixtures were incubated for a further 30 min. To analyze the release of DNA containing the lesion, a 34-mer oligonucleotide is used  as a template by sequanase to incorporate radiolabeled dCTP on the 3' end of the excised fragment then the excised labelled fragments were analyzed on 14% polyacrylamide gel. The effect of HBx expression on repair efficiency of a UV-damaged DNA in the human liver cell was monitored. HBx expressing plasmid pSBDR and a neomycin resistant plasmid pRC/CMV (control) were co-transfected into Chang liver cells. In the plasmid pSBDR, the HBx coding sequences are placed under the transcriptional control of native promoter and enhancer. pRC/CMV DNA was UV damaged for 2, 6, and 8 and 10 J/m2 of UV radiation. As a control, UV-damaged pRC/CMV DNA was co-transfected along with a plasmid pHEN100 lacking the coding sequences of HBx. Cells were counted prior to co-transfection and selected in media containing G-418 for 2 weeks. Thereafter, G-418 resistant clones were counted. A decrease in the number of G-418 resistant clones per 105 cells was observed in HBx expressing cells when compared with non-expressing cells (Figure 1). UV survival profile of HBx expressing human liver cells. HBx expression plasmid pSBDR and UV-damaged pRC/CMV were co transfected into chang liver cells. Plates were incubated in dark for 2 weeks in the presence of G418. The number of G418 resistant cells per 105 cells is plotted. Live cells were counted by staining with trypan blue prior to transfection. The ordinate represents the survival fraction, while the abscissa displays the dosage of UV irradiation. Each bar represents Mean ± S.D. from three independent experiments. We previously reported interactions between HBx and two components of TFIIH, ERRC2 and ERCC3 . We identified a domain spanning aa 110-143, sufficient for these interactions between HBx and ERCC2 and ERCC3  is domain was shown to be sufficient to stimulate the DNA helicase activity of purified TFIIH . To identify the critical amino acids required for TFIIH interactions and associated functions, the conserved negatively charged residues in this domain were selected for mutagenesis studies. Using site-directed mutagenesis technique, individual amino acid residues, Asp 113, Asp 118, Glu 120, Glu 121, Glu 124 and Glu 125 were changed to non-polar Val. These HBx mutants were employed for interaction between HBx and ERCC2 and ERCC3. ERCC2 protein was expressed in E. Coli as a Maltose-ERCC2 fusion protein. Bacterial cellular extracts were immobilized on amylose resin. In this experiment the wild type HBx was in vitro translated and allowed to interact with either Mal-ERCC2 resin or with amylose beads alone. While HBx interacted with ERCC2 (Figure 2A, lane 1), no interaction was seen with amylose resin alone (Figure 2A, lane 6). In vitro translated 35S[methionine]-labeled HBx mutants Glu 120, Glu 121, Glu 124, and Glu 125 proteins were allowed to interact with Mal-ERCC2 (Figure 2A, lanes 2-5). 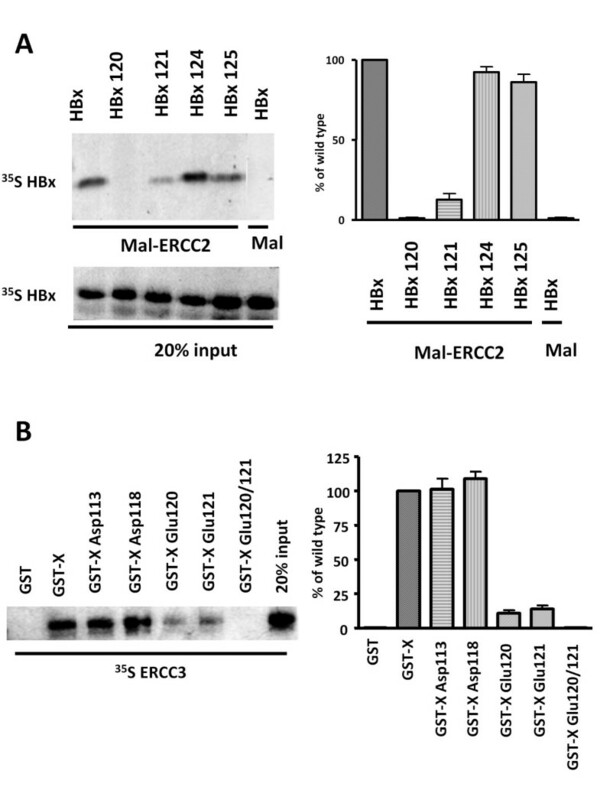 The results of this analysis show that HBx mutant Glu 120 and Glu 121 did not interact with Mal-ERCC2 at any significant level (lanes 2 and 3). HBx mutants Glu 124 (lane 4) and Glu 125 (lane 5) showed only a modest reduction in binding to ERCC2 (see densitometric analysis in the right panel of Figure 2A). HBx 120 and 121 mutants fail to interact with ERCC2 and ERCC3 components of human TFIIH. (A) HBx and HBx mutants 120, 121, 124, and 125 were in vitro translated in the presence of 35S methionine and allowed to interact with the fusion protein of Mal-ERRCC2. Bound fractions are shown. (B) ERCC3 was in vitro translated in the presence of 35S-[methionine] and allowed to interact with GST (lane 1), GST-X (lanes 2), or GST HBx mutants Asp 113 (lane 3), Asp 118 (lane 4), Glu 120 (lane 5), Glu121 (lane 6) and double mutant Glu 120/121 (lane7). 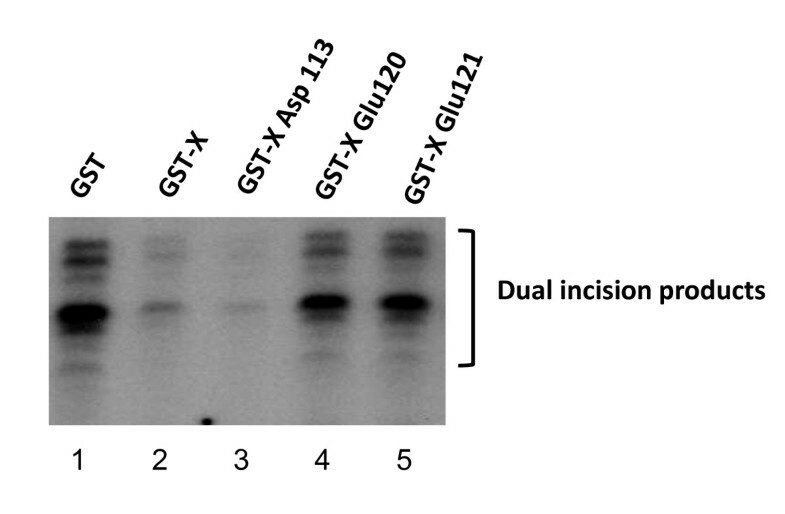 To map the critical residue required for the interaction of HBx with ERCC3, GST pull down assay was performed in which ERCC3 proteins were synthesized in vitro in the presence of 35S[methionine] and allowed to interact with GST-fusion protein of HBx (Figure 2B). While wild type HBx interacted with ERCC3 (lane 2), no interactions were seen with GST (lane 1). HBx's mutants Asp 113 (lane 3) and Asp 118 (lane 4) showed normal interaction with ERCC3. On the other had HBx's mutant Glu 120, Glu 121 showed a reduction in binding to ERCC3 (lane 5 and 6). No interaction has been seen with the double mutant Glu 120/121 (lane 7). Collectively, these studies are consistent in identifying the Glu 120 and Glu 121 of HBx as critical residues involved in interactions with both DNA helicase components of TFIIH. These HBx mutant constructs provide a stronger evidence for the specificity of our previous resorts for the protein-protein interactions. The HBx mutants were tested for their ability to physically interact with the DNA helicase components of yeast TFIIH (yTFIIH). The RAD3 and SSL2 represent the homologues of ERCC2 and ERCC3 components of mammalian TFIIH. In the first experiment, 35S-[methionine]-labelled wild type RAD3 component of yTFIIH was allowed to interact with glutathione affinity beads immobilized with either glutathione S-transferase (GST) or GST-HBxwt or GST-HBxmut fusion proteins which were extracted from bacteria (Figure 3A). After extensive washing, the bound proteins were analyzed by SDS-PAGE. In this analysis only HBx mutant Glu 120 failed to interact with RAD3 (Figure 3A, lane 6). Other mutants either interacted modestly or functioned as wild type HBx (Figure 3A). Reduced interaction of HBX mutants with RAD3 (ERCC2 homolog) and SSL2 (ERCC3 homolog) components of yeast TFIIH. (A) RAD3 was in vitro translated in the presence of 35S methionine and allowed to interact with GST (lane 1) or GST-X (lane 2), GST-XAsp113 (lane 3), GST-X Asp 118, (lane 4) GST-XGlu120 (lane 5), GST-X Glu121 (lane 6), GST-X Glu 124 (lane 7), GST-XGlu 125 (lane 8) and GST-X Glu 120/21 (lane 9). (B) SSL2 was synthesized in vitro and labeled with 35S methionine and allowed to interact with GST (lane 1) or GST-X (lane 2), GST-XAsp113 (lane 3), GST-X Asp 118, (lane 4) GST-XGlu120 (lane 5), GST-X Glu121 (lane 6), GST-X Glu 124 (lane 7), GST-XGlu 125 (lane 8), and GST-X Glu 120/21 (lane 9). Next, we also employed 35S[methionine]-labelled SSL2 homology of ERCC3 for its ability to interact with GST-X mutant proteins immobilized on GST affinity beads (Figure 3B). Consistent with Figure 3A, the results of these interaction studies identified Glu 120 as a critical residue for interaction with both components of yTFIIH. To further correlate the effect of HBx associations with TFIIH, we employed a UV hypersensitivity assay as described by Gulyas and Donahue . These authors have generated a SSL2 mutant (Ssl2-xp) that mimics the ERCC3 defect found in XP patients. This non-lethal mutant allele of SSL2 was shown to increases the sensitivity of yeast to UV irradiation when tested in an in vivo assay for viability. Upon UV irradiation of yeast, in which Ssl2-xp was the sole copy, 103 more cells died when compared to wild type, suggesting a direct correlation between defects in DNA repair enzymes and UV hypersensitivity. Using this assay system, the influence of HBx on DNA repair process in yeast was examined. HBxwt and selected HBxmutants were cloned in the yeast plasmid pYES with a selectable marker (Ura3) in which X is under the control of inducible galactose promoter. Yeast strain that lacks the galactose repressor (GAL-80) was used to transform and subjected to UV irradiation assay as described . 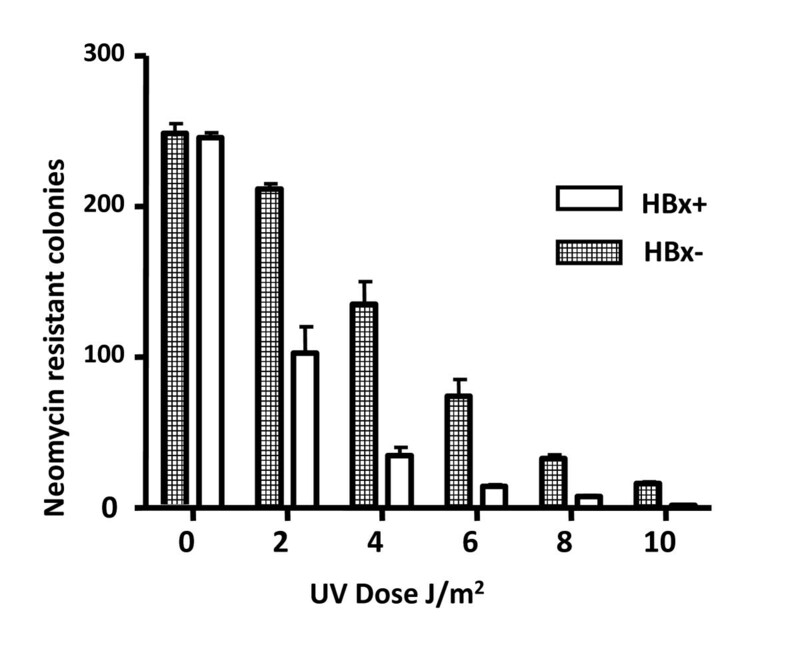 The results of UV irradiation experiment shown in Figure 4A, clearly suggest that yeast expressing HBx displayed an increased UV hypersensitivity. Since, we earlier showed that HBx interacts with SSL2 and RAD3 component of TFIIH , it is conceivable that the interactions between HBx and SSL2 and/or RAD3 are reflected in the impediment of cellular DNA repair process. To address this issue, HBx point mutants were employed. HBx mutants Glu 120, 121, 124, and 125 were transformed into yeast and assayed for UV hypersensitivity assay. HBxmut120 which fails to interact with human and yeast TFIIH failed to influence the DNA repair in yeast (Figure 4A). The expression of HBxmut proteins in yeast cells was confirmed by Immunoblotting. In all cases, similar levels of HBx expression were observed (data not shown). The results of the UV hypersensitivity assay are consistent with the hypothesis that the inability of the HBx to interact with TFIIH directly correlates with its inability to impede the DNA repair process. HBx expression increases the UV sensitivity of yeast cells. (A) UV survival profile of HBx expressing yeast cells. Saturated yeast cultures of strain 334 containing plasmids, pYES and pYES-Xwt and pYES-Xmuts (as indicated), were diluted in water and plated on YMIN plates containing 2% glucose, 2% glycerol, 2% ethanol and 2% galactose (for induction of HBx). Cells were immediately irradiated under a germicidal lamp. Plates were then incubated in dark for at least 24 hrs and shifted to 30°C. Colonies were counted to determine the survival fraction. This is the average of three experiments. The ordinate represents the survival fraction, while the abscissa displays the dosage of UV irradiation. (B) UV survival profile of HBx expression in TFIIH mutant yeast cells. This is the average of three experiments. The ordinate represents the survival fraction, while the abscissa displays the dosage of UV irradiation. We next asked the question, does the expression of HBx in the mutant yeast strain lacking the carboxyl-terminus of SSL2 (ERCC3 homologue) affect the UV survival profile? A mutant yeast strain with a deletion of 79aa in the carboxyl terminus of was used in the UV-hypersensitivity experiment . The deletion in ssl2 strain overlaps with the ERCC3 deletion mutant that contains the ATPase activity and does not interact with HBx (data not shown). The yeast strain was transformed with plasmid pGal4-Xwt. 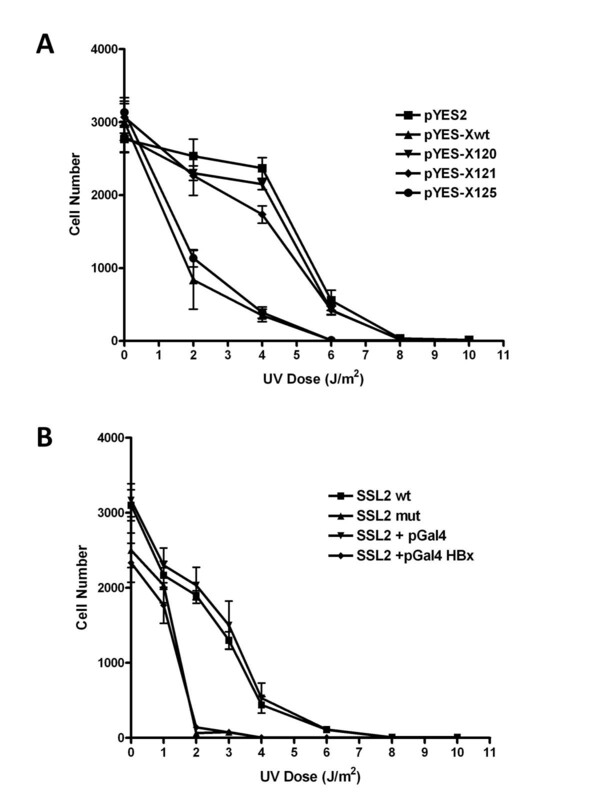 In the UV hypersensitivity experiment, HBx did not affect the survival profile of the mutant yeast strain with C-terminal deletion of SSL2 (Figure 4b). These results suggest that TFIIH regulated pathway is utilized by HBx in the impediment of the DNA repair process and that HBx-TFIIH physical interaction is crucial to influence this process. Next, we assayed the efficiency of HBx expressing yeast cell lysates to repair UV-damaged plasmid DNA. This was compared with non-expressing and HBx mutant expressing cell lysates. Wang and co-workers  developed a fairly simple and effective assay to monitor DNA repair in vitro. This assay relies on the repair synthesis of a plasmid which has been previously treated with a base-damaging agent N-acetoxy-2-acetylaminofluorene (AAAF) or UV irradiation. Damaged plasmids are incubated with wild type yeast cell-free extracts and 32P-labeled dCTP. Radioactivity incorporated into the damaged plasmid during DNA repair is observed by agarose gel electrophoresis followed by autoradiography. By employing the mutant alleles of RAD3 and SSL2, Wang and co-workers  were able to define a functional role for yeast TFIIH in DNA repair. We employed this assay to determine the effect of HBx on DNA repair process in vitro. To control the specificity of in vitro DNA repair reaction, we also used TFIIH (ssl2) mutant and NER defective rad 1 and rad51 deletion yeast strains as controls. First, UV irradiated plasmid pBR322 was subjected to DNA repair in vitro, with extracts of wild type yeast strain 334 and those transformed with pYES-2 (vector alone), pYES-X (HBx expressing vector) and its mutants Glu 120, Glu 121, Glu 124 and Glu 125. Un-irradiated plasmid pUC18 DNA was used as a control. Yeast lysates were prepared 16 hr after treatment with 2% galactose for the expression of HBx and its mutant proteins. HBx and its mutant proteins were expressed equally in these yeast strains as confirmed by Western blotting (data not shown). Figure 5A shows the results of this experiment. The repair synthesis of UV irradiated plasmid pUC18 using the yeast crude extracts transformed with vector alone (lane 1), HBx expressing vector, (lane 2) and HBx mutants Glu 120 (lane 3), Glu 121 (lane 4), Glu 124 (lane 5) and Glu 125 (lane 6). The incorporation of 32P[dCTP] as a measure of DNA repair is shown in Figure 5. These results clearly suggest that HBx expressing yeast lysates are defective in repairing the UV-damaged DNA in vitro (compare lane 1 with lane 2). HBx mutant Asp 113 that has retained the ability to interact with TFIIH (Figure 2A-C) also retains the ability to impede the DNA repair process like wild type HBx (lane 3). Yeast lysates expressing other mutants of HBx showed varying degrees of DNA repair efficiencies (lanes 4-7). More importantly, HBx's mutant Glu 120 which failed to interact with TFIIH also failed to influence the repair process in vitro (lane 3). The results shown in Figure 5A are encouraging, as no incorporation in the un-damaged pBR322 DNA was observed. To further confirm that non-specific incorporation of radioactivity has not occurred in this reaction, we used HBx expressing NER defective yeast lysates. Two mutant yeast strains with deletions in Rad-1 and Rad-51 were transformed with HBx expressing plasmid pGAL4-X and a control plasmid pGAL4. Yeast lysates were prepared after 16 hrs induction with 2% glacotose and subjected in repair reaction (Figure 5B, lanes 3-6). Both Rad-1 and Rad-51 NER defective lysates showed no incorporation (lanes 3 and 5). HBx expression in these mutant yeast lysates had no effect on the repair reaction (lane 4 and 6). 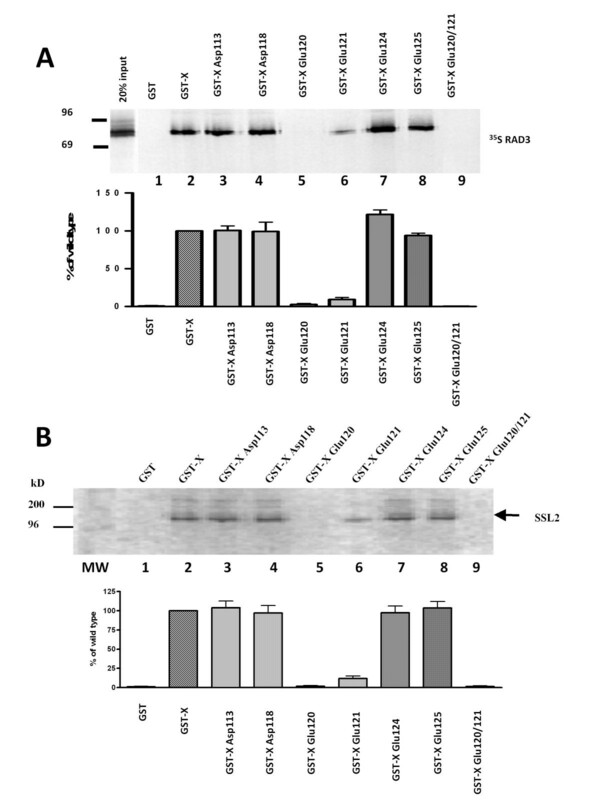 This suggests that indeed specific DNA repair reaction has occurred in Figure 5A. These results are consistent with the hypothesis that HBx expressing wild type yeast lysates have diminished DNA repair efficiency of UV-damaged plasmid DNA. HBx impedes the DNA repair of UV damaged plasmid DNA in-vitro. (A) In vitro repair of UV-damaged pBR322 DNA using yeast lysates expressing HBx and its mutants. The repair reaction contained, 0.3 μg un-irradiated pUC18 and 0.3 μg UV-irradiated pBR322 substrate, was performed as discussed in the experimental procedure. Control plasmid (lane 1); HBx expressing plasmid (lane 2); and its mutant Glu120 (lane 3); Glu 121 (lane 4); Glu 124 (lane 5) and Glu 125 (lane6). Reactions were incubated for 6 hours at 30°C. Reactions were stopped by the addition of EDTA and then incubated with RNAse, SDS and proteinase K. Plasmids were digested with HindIII and loaded on 1% agarose gel. After overnight electrophoresis, the gel was photographed under near-UV transillumination with Polaroid film (right panel) and an autoradiograph of the dried gel was obtained (left panel) (B) HBx is unable to repair the damaged plasmid DNA in Rad1 and Rad51 mutant yeast strain. Plasmid p-GAL4 and pGAL4-X were transformed into yeast strains with normal RAD1 and RAD51 genes (lane 1, 2), with deletion of Rad1 (lane 3, 4) and with deletion of RAd51 (lane 5-6). 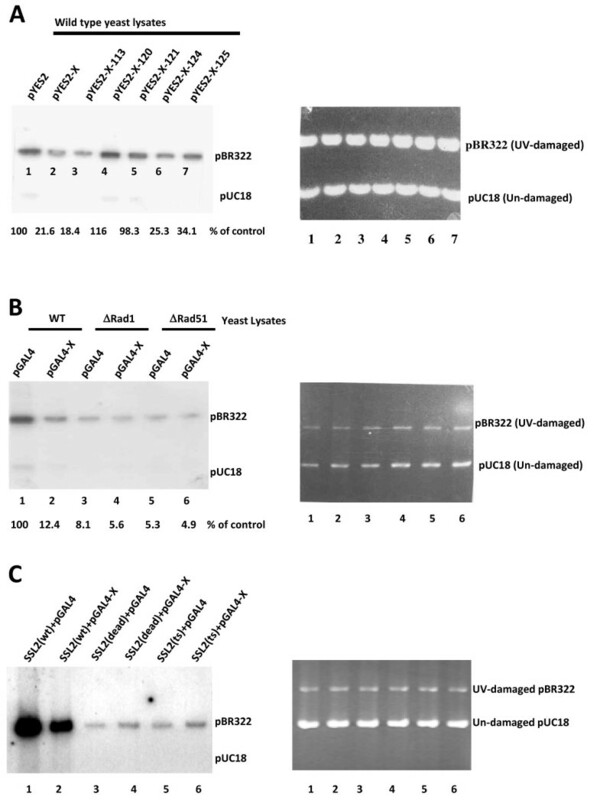 Nuclear extract were assayed for DNA repair of UV-damaged pUC18 DNA (C) HBx is unable to repair damaged plasmid DNA in SSL2 mutant (dead) and temperature sensitive yeast strain. Plasmid p-Gal4 and pGAL4-X were transformed into yeast strains with normal SSL2 (lane 1, 2) mutant SSL2-dead strain (lane 3, 4) and temperature strain (lane 5-6). Nuclear extracts were assayed for DNA repair of UV-damaged pBR322 DNA The yeast ts strain was grown at room temperature (20-21°C). Next, we examined the ability of HBx to alter DNA excision repair reaction in a TFIIH mutant yeast strain (Figure 5C). Wild type yeast strain and two TFIIH mutant yeast strains ssl2 (dead) and ssl2 (ts)  were transformed with a control plasmid pGAL4 and HBx expressing pGAL4-X DNAs. Yeast lysates were prepared as described. UV-damaged pBR322 DNA was used. Consistent with our previous results, HBx expression in wild type strain diminished the ability to repair the DNA (lane 2). TFIIH mutant yeast lysates with HBx (lane 4 and 6) or without HBx (lanes 3 and 5) were equally deficient in DNA repair synthesis, suggesting that HBx impinge its influence on DNA repair via TFIIH. In summary, using myriad experimental strategies, our results implicate HBx in DNA repair process via its physical interactions with the helicase components of TFIIH. To measure the effect of X protein on the excision of the Damaged DNA, we used 40 μg of HeLa whole cell extract and 20 ng of Pt-DNA. Figure 6 shows that HBx or HBx 113 mutant but not HBx120 or HBx121 is able to inhibit the excision of the platinated fragment. HBx protein inhibits excision of damaged DNA in dual incision assay. Measurement of the effect of X protein on the dual excision of the Damaged DNA using 40 μg of HeLa whole cell extract and 20 ng of Pt-DNA. GST (lane 1) or GST-X (lane 2), GST-XAsp113 (lane 3), GST-XGlu120 (lane 4), GST-X Glu121 (lane 5). HBx protein has been proposed to play a role in the development of HCC. HBx has been shown to possess pleiotropic functions including impairment of cell cycle progression , interaction with transcription machinery [9–13], and cell signal transduction and apoptosis mechanisms [29, 52–54]. Furthermore, HBx associated physically with p53 resulting in the sequestration of p53 in the cytoplasm (28), inhibition of p53 function including its DNA binding and transactivation activities  as well as p53 interaction with XPB protein . Several studies suggested a potential role of HBx cellular DNA repair process. This is borne out by its associations with TFIIH [25, 28], a probable DNA repair factor UV-DDB [23, 42, 56], p53 tumor suppressor protein [55, 57], ss-DNA , and UV-damaged DNA [58, 59]. Our study provides evidence that HBx can inhibit DNA repair pathway. In the absence of UV damage, cells expressing HBx were found to be similar to control cells in cell growth measured by colony formation assay (Figure 1). Similar observations were reported by Lee and co-workers . They demonstrated that HBx expression did not affect the morphology, viability, and cell cycle/apoptosis profiles or DNA repair machinery of UV-untreated HepG2 cells. However, HBx-expressing cells exhibited increased sensitivity to UV damage and reduced DNA repair capacity. It has been shown that mice carrying HBx as a transgene show a direct correlation between the level of HBx expression and the likelihood to develop HCC [61, 62]. However certain lineages of HBx transgenic mice do not exhibit tumour development unless coupled with other factors such as exposure to the hepatocarcinogen diethylnitrosamine  or when combined with c-myc induction . It has been suggested previously that HBx does not directly cause cancer but plays a role in liver oncogenesis as a cofactor or tumour promoter . Chronic HBV infection may present a long-term opportunity for an initiating event to occur, and HBx may act by modifying cellular regulatory/control mechanisms facilitating the culmination of the transformation process in the cell. In this regard, a highly probable tumour-initiating event is DNA damage. We continue to characterize the specific domains of HBx involved in affecting the DNA repair process. We have employed approaches to elucidate the mechanism(s) by which HBx interactions with DNA excision repairs factor TFIIH could lead to impaired DNA repair. DNA repair system is the primary defence against accumulation of mutations in genomic DNA and activation of cellular carcinogenesis. Deficiencies in DNA repair pathways have been linked to common cancer predisposition syndromes. Notable among these are the hereditary nonpolyposis colorectal cancer (HNPCC) and skin cancer or xeroderma pigmentosum [46, 65]. DNA repair occurs by kinetically two different pathways: one involved with repair of the overall genome (global repair) and one involved with repair of transcribed genes (transcription coupled-repair) [46, 66, 67]. Studies have demonstrated that some of the essential DNA repair proteins in yeast and mammalian cells are a part of basal transcription factor TFIIH [26, 67, 68]. In humans, the defects in XPD/ERCC2 and XPB/ERCC3 genes lead to xeroderma pigmentosum (XP)  and Cockayne's Syndrome (CS) [65, 66]. Both conditions are manifested by the inability of the cells to efficiently repair damaged DNA. In yeast, RAD3 and SSL2 (RAD25) are the homologues of XPD/ERCC2 and XPB/ERCC3 respectively. These genes are essential both in yeast and mammals. Since TFIIH is one of the minimal set of factors required for transcription initiation and DNA excision repair, the association of HBx implicates a fundamental role in the processes affected by HBx [70, 71]. A large body of data, supports the transcriptional transactivation role of HBx [11, 72, 73]. It remains to be determined if HBx's ability to stimulate DNA helicase activity of ERCC2/ERCC3  is functionally relevant to both DNA repair and transcription initiation. Many studies showed that HBx plays an important role in HCC pathogenesis by interacting with cellular oncogenes [21–23] and that its functional domain involved in oncogenesis is at the middle of HBx protein [24, 25]. Several studies have also shown that HBx can induce apoptosis [26–29]. Tang and co-worker has mapped the coactivation domain within the C-terminal, two thirds of which (aa51-138) is identified to that of the transactivation. In contrast, the N-terminal of HBx has the ability to down regulate transactivation and was defined as the negative regulatory domain . It has been shown recently that the COOH-terminal truncated HBx plays a critical role in the HCC carcinogenesis via the activation of cell proliferation . Alteration of HBV X gene has been detected more frequently in tissue samples of cirrhosis and/or HCC than in those of mild liver disease . However, the mechanism of HBx in HCC carcinogenesis is still unclear, although many studies have associated it to ability of HBx trans-activating cellular oncogenes and signaling cascades that stimulate cell proliferation and lead to HCC carcinogenesis [1, 17, 77–79]. It has been demonstrated that the full-length HBx contains two function domains: oncogenic domain (the NH2 terminal through middle peptide) and proapoptotic domain (the COOH-terminal peptide). There is a balance between these two functions in HBV-infected hepatocytes. When the proapoptotic domain is deleted by an unknown mechanism during the viral integration, the balance is broken and the oncogenic function becomes dominant, leading to the subsequent development of HCC. HBx has been shown to enhance cell susceptibility to cytotoxic effect of genotoxic agents, e.g. UVC and aflatoxins, that induce bulky adducts. This effect has been linked to impaired regulation of DNA repair and associated cell cycle checkpoint mechanisms [24–27], and/or the proapoptotic effect of HBx . DNA damage induced by bulky adducts are preferred substrates for NER mechanism, where the TFIIH repair complex plays an essential role . Inhibition of TFIIH activity by HBx may inhibit DNA repair and hence promote cells to undergo apoptosis. While several studies have focused on the transactivation capacity of the HBx protein in carcinogenesis, our data indicates that HBX is capable of transcriptional repression while maintaining it transactivation functions on NF-kB and AP1 responsive elements. The implication of transactivation in carcinogenesis is demonstrated primarily in transient systems and there is evidence that HBx-induced transactivation is not sufficient for cell transformation . The observation that HBx suppresses XPB and XPD in liver tissue from HBx-transgenic mice supports the biological relevance of our findings. XPB and XPD helicase and ATPase activities, but not the TFIIH kinase, are required for NER function [30–33]. Previous studies have shown that HBx inactivate the p53 tumour suppressor protein and impair DNA repair, cell cycle, and apoptosis mechanisms. HBx was shown to represses two components of the transcription-repair factor TFIIH, XPB (p89), and XPD (p80), both in p53-proficient and p53-deficient liver cells. This inhibition is observed while HBx maintains its transactivation function. Expression of HBx in liver cells results in down-regulation of endogenous XPB and XPD mRNAs and proteins. In liver tissue from HBx transgenic, XPB and XPD proteins are down-regulated in comparison to matched normal liver tissue . HBx expression on hepatocytes nucleotide excision repair has been successfully studied in primary wild-type and p53-null mouse hepatocytes. Transient HBx expression reduces global DNA repair in wild-type cells to the level of p53-null hepatocytes and has no effect on the repair of a transfected damaged plasmid . Inhibition of p53-mediated apoptosis by HBx may provide a clonal selective advantage for hepatocytes expressing this integrated viral gene during the early stages of human liver carcinogenesis . To date, a few mechanisms of HBV-induced HCC have been proposed. Early studies proposed that insertional mutagenesis of the HBV genome into human chromosomes might cause inactivation of tumor suppressor/proto-oncogenes [80–82]. However, later studies have shown that integration of HBV genome is genome-wide and unlikely attacks a specific tumor suppressor or proto-oncogene [82, 83]. HBx initiates transactivation as well as induction of signal transduction pathways such as Ras/Raf-1 [84, 85]. The large surface protein has been shown to induce HCC in the transgenic mouse model [86, 87]. Our results are consistent to the hypothesis that HBx impedes the DNA repair via interaction with TFIIH. In the dual incision assay HBx120 or HBx121 mutants fail to impede the repair process. These two residues seem to be critical determinant in DNA repair in HBx mediated inhibition as two mutants fail to interact with TFIIH. In our study, we defined an inhibitory role of HBx in DNA excision repair process, thus hampering the cellular ability to repair the damaged DNA more effectively during HBx expression. Recent studies on HCC in Taiwan, the pre-S1/S2 mutant were shown to induce oxidative stress and DNA damage in Ground glass hepatocytes (GGHs), the pathological hallmarks for late phases of chronic HBV infection . Other studies have reported that a defect in the ogg1 DNA repair gene is involved in various types of human carcinogenesis . Therefore, efficient DNA repair for damaged DNA should play an important role in cancer prevention. Our findings suggest that HBx may act as the promoting factor by inhibiting DNA repair causing DNA damage and accumulation of errors, thereby contributing to HCC development. We thank Drs A Prakash and L. Prakash (University of Texas, Galveston, TX) for Yeast Rad1 and Rad51 strains and Dr. K. Guylas (Stanford University, Stanford CA) for yeast SSL2 strains. We are indebted to Drs. J. Egly and J. Hoeijmakers (INSERM, Strasbourg, France) for ERCC2 and GST-ERCC3 and Drs. JW Conaway and RC Conaway (University of Oklahoma, OK, USA) for the TFIIH purified fractions and Dr. Aleem Sidiqqui (University of California, San Diego, CA, USA) for HBx constructs. The support for this work was provided by the University of Colorado, Thorkilson Award and US State Department Grant (IQ) and the University of Colorado School of medicine grant to HAH. IQ conceived the idea coupled with the design and execution of experiments and have also written the manuscript. KF and HAH performed Dual incision assay, in-vitro experiments, prepared Figures and edited the manuscript. The financial support was provided by grants to IQ and HAH.